Aston Martin presented the first verification prototype of the Valkyrie at Geneva. Aston Martin blew the doors off this year’s Geneva Motor Show with the reveal of three incredible concept cars. The All-Terrain Concept gave us a first look at the Lagonda ultra-luxury brand’s first electric SUV, while the Vanquish Vision and AM-RB 003 previewed Aston Martin’s future mid-engined machines. 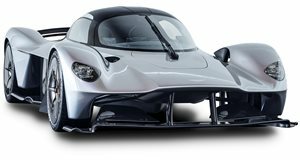 However, these models arguably overshadowed the debut of a new Valkyrie prototype previewing Aston Martin’s extreme hypercar currently in development with Red Bull. Aston Martin described its latest Valkyrie preview as the "first verification prototype.” In other words, the design you’re looking at here should closely mirror the final production model when customer deliveries begin later this year. The striking shaping has been designed to be as aerodynamically efficient as possible with a pronounced front splitter and side skirts, and a two-part active rear wing that generates an insane amount of downforce. Last week, Aston Martin finally confirmed the Valkyrie’s astonishing technical specifications. Powering the groundbreaking hypercar will be a 6.5-liter V12 developed by Cosworth producing 1,000 hp and 545 lb-ft of torque, which happens to be the world’s most powerful non-turbocharged production engine. A battery-electric system from Rimac adds an additional 160 hp and 206 lb-ft of torque, bringing the total output to a staggering 1,160 hp at 10,500 rpm and 663 lb-ft of torque at 6,000 rpm. The battery pack can drive all of the car's various sub-systems and provide power boost and energy recovery. It even has a KERS-style boost system akin to those fitted to F1 cars. Performance specs still haven't been confirmed, but rest assured they will blow your mind. A track-only AMR Pro version of the Valkyrie will deliver Formula One-style performance, but you’ll be able to add racing components to the road version with Aston Martin’s Track Performance Pack. Production of the Valkyrie will be limited to 150 units, while the AMR Pro version will be limited to just 25 examples.